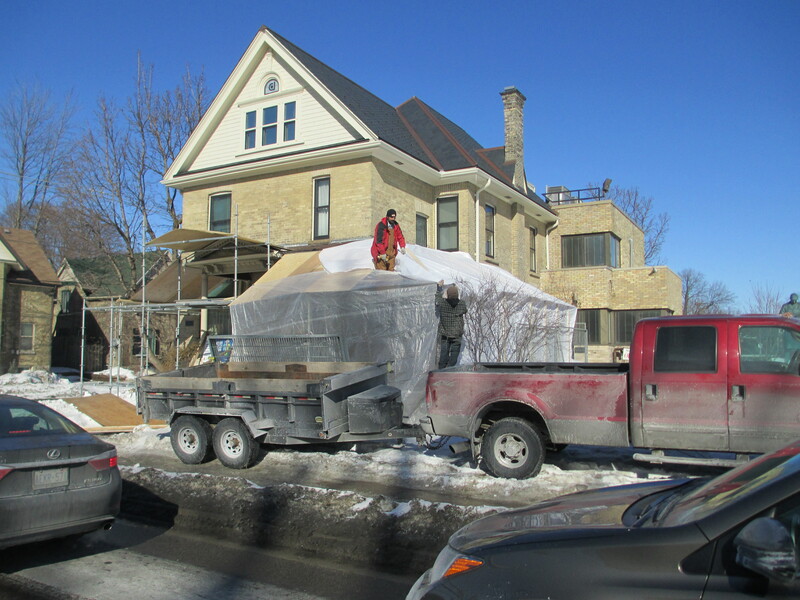 Recently, you may have noticed that the front of Banting House National Historic Site of Canada has been covered in scaffolding and tarp. People are running back and forth. In the offices, we’ve been working alongside the sounds of construction. Some museum visitors have been asking us why we’ve been using the side door instead of the usual front porch. What is going on? Not to worry – this long winter hasn’t caused any damage to the building. The project currently underway is a restoration. With the help of a Community Infrastructure Investment Fund grant from the federal government, Banting House is getting a facelift. The restoration project has been going on now for several months. It will return Banting House to a state closer to what Frederick Banting would have experienced when he lived there in the early 1920s. This in turn helps us maintain our museum’s commemorative integrity. Our main concerns were replacing the deteriorating slate roof – sections of which had weathered 113 years – restoring the siding and repointing the brickwork, and repairing the front porch. The before and after pictures of the historic house demonstrate just how much of a difference this maintenance work has made! As the work has progressed, we’ve made some interesting discoveries. Our curator had always known the columns for the porch were a little “off” in terms of the detailing (they were added during a renovation in the 1980s), but after beginning work on the porch we discovered just how “off” they were. It turns out that the original roof of the porch came down several inches lower, had large elaborate brackets, and had short, stubby columns rather than long, skinny ones. By doing a little more detective work (searching in our archives for old photos of the house, inspecting the brick of the porch to spot shadows of where previous structures were) we were able to discern what the porch should actually look like. Restoring the porch will be the final task for our construction crew before the restoration project’s funding comes to an end. As you can see, doing restoration work on a historic home is not the same as working on a home reno. Our vision for the job is guided by the Standards and Guidelines for the Conservation of Historic Places in Canada, published by Parks Canada. This document spells out how to ensure a restoration is done properly. Just as important, however, is the expertise and eye for detail of an experienced, passionate restoration contractor. The contractor and construction crew on this project know just how to accommodate these extra guidelines. In fact, they were the ones who spotted the inconsistencies in the porch, and stopped work in that area until we had a chance to do further research. The results of their enthusiasm and hard work are plain to see – or they will be, once the tarp comes off. We follow the Standards and Guidelines by Parks Canada. Historic catalogues helped us choose proper paint colours. Extensive work is being done on the porch before the funding period ends. Work on the bulkhead will restore the look of the porch to its original condition. We say “so long” to these long columns. Posted in Behind the Scenes at Banting House.Tagged London, Museums, repair, restoration, transformation. Next Post A (graphic) novel approach: the Banting biography as you’ve never seen it before!